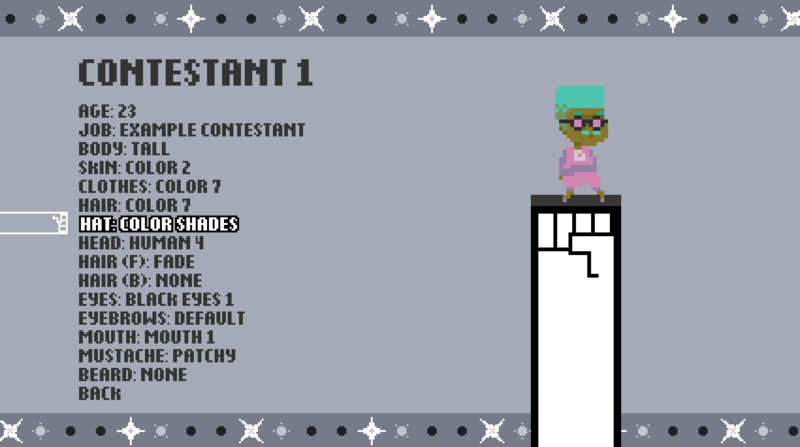 Fist's Elimination Tower is a HaxeFlixel game where you play as a series of contestants trying to make their way to the top of a vertical obstacle course by bouncing on all the enemies on each floor in one go (I never really explain why the last enemy is the one that makes you bounce so much higher, but it does). The trick is, once you hop on one enemy, you have to hop on all the others without touching the ground again, or else that player gets eliminated, and is replaced by the next one (which is randomly generated from a series of colors and hats). ...or by springing out when you jump on an enemy of the same color. The floors are arranged in a set order (so that the player can be familiarized with each individual obstacle type), but I'm thinking there'll also be a mode where the floors are randomly scrambled, which is especially tricky, since some floors only give you a couple seconds to move before you're crushed by a fist or something. The game is still kinda sparsely decorated - partially because I want the colored enemies to stand out, and partially because I've been focusing on other things, like new obstacles and character customization (yes, you'll be able to create your own contestants and dress them in hats you buy using those coins that fall down between floors).